A last-minute delay in travel plans allowed me to get on board Saturday's Brookline Bird Club EXTREME PELAGIC to the edge of the Continental Shelf, and boy am I glad. I've been on several of these over the past few summers, and yesterday's trip was certainly one of the best. Normally these trips are characterized by hours of empty ocean between bursts of activity, but there were very few periods without birds yesterday. The real highlight was a BLACK-CAPPED PETREL that gave somewhat brief but fantastic views as it made a couple passes by the boat! Bigtime thanks to James P. Smith for being the first to spot and yell out to the rest of us! James was somehow able to obtain a couple of fantastic digibinned images which I'm sure will be posted to his blog, Pioneer Birding, in the coming hours. Jeremiah Trimble has already posted a fantastic set of images, including a few of the day's star pterodroma! Soon after we lost the petrel we attempted to draw it back in with a chum slick. During this time I fired up my phone and attempted to log the coordinates using its GPS function. These are not the 'official' coordinates, but it should be very close. I mapped the location on Google Earth. You can see that the petrel was NOT seen in the deep water of the canyon or beyond the shelf edge; rather is was seen in 400-or-so feet of water before we reached the Atlantis Canyons. That's not very deep. 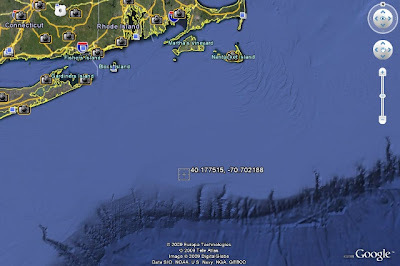 To put things in perspective for any Connecticut birders reading this, Long Island Sound is well over 200 feet at its deepest points. The rest of the trip was characterized by fantastic numbers of Leach's Storm-Petrels and Audubon's Shearwaters, not to mention an abundance of Cory's Shearwaters, particularly on the way to and from the deep water. For anyone who hasn't tried it, pelagic birding is among the most exciting birding there is. I will be updating this space with more links, as photos and trip reports become available. The BC Petrel looks like it's on the stocky, really white-faced end of the BC Petrel spectrum, as opposed to the darker, thinner birds. Hi Nate, that's a great point about the bird. I agree, going by the photos by Patteson and Howell on seabirding.com. Thanks for that. This trip was one of the consistently birdier deep-water trips I've done up here. We had no huge gatherings or feeding frenzies, but there were usually storm-petrels and shearwaters to sort through. Sadly, we observed a Northern Right Whale that was injured dorsally AND entangled in fishing equipment. It was quite sad to watch the endangered species struggle. The captain took the coordinates and let the authorities know about the situation. Their plan was to try to re-locate and save the whale today, possibly using aircraft to find it. Brian's site is a great reference, and his trips out of Hatteras are a blast, even if his boat is pretty wet. All of the pelagics I've been on have been through him and I've never been disappointed. I know Brian considers the two pops of BC Petrel to potentially be distinct species, Steve Howell may be on that boat too. And even in my relatively limited experience, the differences are pretty clear, especially if you're keyed into them. I can recall two specific trips out, one in May and one in September, where the birds in May were largely the white-faced ones and the September birds were almost all darker ones with smaller collars. I'm certainly no expert or anything, but it really seems like something's up with that. But one of the coolest things about pelagics is how much we don't know about the birds out there, even in this day and age. It can get addicting.